It’s serious now, really serious. Last week’s win over Peterborough United puts us to within a point of the play-offs, sixth-place Doncaster Rovers are away to league-leaders Luton Town, there is a realistic chance of moving into the top six with a win here over Oxford United. With our remaining away fixtures against teams currently above us in the table, it makes it important that we make the most of our remaining home fixtures to ensure that we are at least within three points of Doncaster Rovers to make the final day of the season a pre-play-offs play-off. Mark Robins’ job of selecting the team is straightforward at the moment, don’t change a thing. With a solid and settled defensive unit, the big difference over the past month has been the midfield and attack clicking into gear. The addition of Bright Enobakhare has provided us with an important fulcrum into the final third, while providing individual moments of unpredictability to diversify our attacking threat. With Jordy Hiwula and Amadou Bakayoko coming into form, we appear to be more confident of scoring goals from an array of sources, while Tom Bayliss and Luke Thomas remain consistent threats and Liam Kelly patrols the base of midfield with calm authority. The one unenforced change may possibly be Junior Brown for Brandon Mason – who is both not in great form and still struggling for fitness. Luke Thomas is a fitness concern after the kick to the face he sustained in last week’s win over Peterborough United, but from the sounds of things, he’ll be okay to be involved in this game. We were still looking to find our feet in League One when we took on Oxford United back in September. With Karl Robinson’s side already having beaten us in the League Cup a few weeks before, a strong first-half performance suggested that the U’s were simply the better of the two sides. However, an own-goal, deflected from a Jordan Shipley effort, turned the momentum of the game, with Shipley playing a decisive role in winning a penalty for Conor Chaplin to convert to make it 2-0. A late consolation from a corner-kick routine made for a nervy closing few minutes as we registered an important win early in the season. Despite struggling against relegation with a very talented squad, Karl Robinson’s position as Oxford United manager is under relatively little pressure. This is largely the result of off-field problems surrounding the cash-flow from a foreign-based owner in Sumrith ‘Tiger’ Thanakarnjanasuth as well as ongoing disputes with former owner Firoz Kassam who owns Oxford’s three-sided home stadium which dates back over a decade. Robinson has pointed towards a horrendous run of injuries in the opening months of the season as his main defence, arguing in his pre-match press conference that his side wouldn’t be far from the play-offs if the season had started 10 games in. However, his tactics and squad-building have been under the spotlight during a campaign where his side have struggled to build momentum. Robinson prefers a possession-based style of football and has packed his squad with 14 midfielders, just four defenders and without a focal-point centre-forward up front, often leaving Oxford stretched at the back and struggling to convert chances in attack. Oxford’s best players are undoubtedly their wingers and attacking-midfield players, which will make defending the space between defence and midfield a key area for us in this game. Injuries and international call-ups have narrowed Karl Robinson’s options, yet in James Henry in the central attacking-midfield role a key source of goals and creativity, and the pace of Marcus Browne (who was once very close to signing for us) and Jordan Graham (who was born in Coventry) in the wide positions, Oxford have three players in the three of their 4-2-3-1 system who would walk into most League One sides. 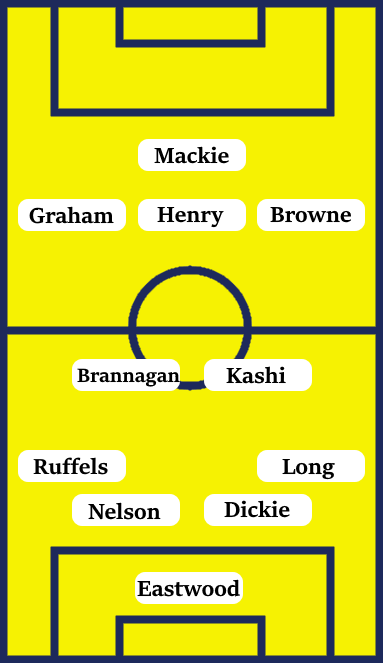 A key cog in this Oxford United side is the energy and skill of Cameron Brannagan in central midfield. Once seen as Liverpool’s star youth prospect, Brannagan has followed the path of the likes of John Lundstram and Ryan Ledson in moving out of the Premier League academy system and to the Kassam Stadium in order to establish themselves away in senior football. He is likely to be partnered with one of the experienced and physical duo of Ahmed Kashi or John Mousinho. In goal, Oxford have Simon Eastwood, who is one of the best stoppers at this level and whose injury at the start of the season coincided with their worst run of form. At centre-back, Oxford have Curtis Nelson who is also one of the best in his position in League One, although hasn’t quite been at his best form this year with rumours suggesting he’ll leave in the summer when his contract expires. Oxford have an odd away record, while they have won just once on the road all season, they have lost fewer away games than ourselves. The lack of a focal-point centre-forward has probably played a big role in these struggles with their current options of Jerome Sinclair and Jamie Mackie decent at running in behind but seemingly not the most clinical of finishers, while struggling to bring Oxford’s quick and skilful wingers and attacking-midfielders into play. In defence, Oxford’s lack of numbers have meant that they’ve consistently used midfielders in their back four – although, given Oxford’s recruitment this season, this may be a deliberate choice from Karl Robinson. While Josh Ruffels (a former Sky Blues academy player) and John Mousinho have regularly played in defence, they tend to be prone to the positional errors that inexperienced defenders make.